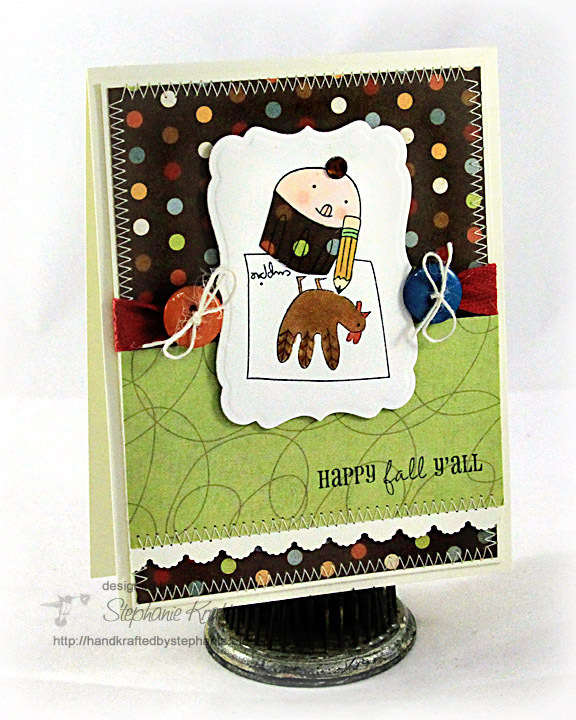 HandKrafted by Stephanie: Happy Fall Y'all! Hello! Happy Weekend and Happy Fall Y'all! It's finally beginning to feel a little like fall around here! It's been a little rainy and overcast (though it's supposed to be sunny and 80 this weekend).. 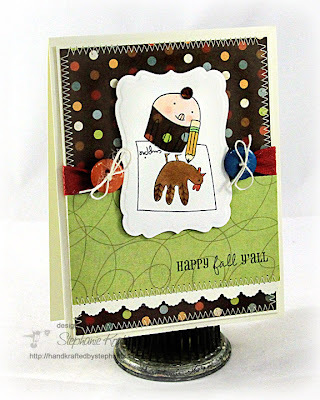 I had a little "me" time today (aka stamping time), so I decided to play with some of my goodies from Taylored Expressions. It's been way too long since I've played with dear sweet Cuppie.. : ) So, I pulled out the newest Cuppie set, Gobble Gobble. I chose the sweet little artist cuppie who is putting the finishing touches on his latest drawing. I stamped and colored him with Copic markers and also did a little paper piecing. All of my papers, buttons and ribbon are from the October Key Ingredients. I just love getting this little package every month. It takes the guess work out of what to use as it is full of coordinating products! Other Accessories: Labels Seventeen Nestabilities (Spellbinders), Markers (Copic), Foam tape, Thread, Sewing machine. Oh dear Stephanie! This card is the cutest thing! Love that darling image! You did a great job with the coloring & paper piecing! Very cute! Between Halloween and Christmas, it seems like Thanksgiving barely gets any attention. Nice to see this. Have a great weekend! What a fun image and love how you have showcdased it!